100% eLearning-based, our Certification Programs are designed with flexibility and convenience in mind, for busy Marketing, Business & Advertising professionals and students. All you need is a computer or tablet and an internet connection and you are set to go. With its well-rounded, 360-degree indepth study of Marketing ROI, this Program is developed for (1) Marketing professionals who currently hold Marketing, Advertising and/or Market Research responsibilities, and (2) for Students or Graduates of an undergraduate or postgraduate degree in the fields of Marketing, Advertising, Market Research or Business. What is an ROI Marketer®? An ROI Marketer® is a 360-Degree Performance Machine Trained to Deliver (Real) Business Results: More Sales, More Market Share, More Prospects, More Conversions™. The no-nonsense ROI Marketer® is science-driven, speaks the Finance & Accounting language, is an expert in Customer Demand (growth) generation thanks to an Engineer-like 8-Point Marketing Performance Formula, and is a relentless All-Media Performance-Tracker: at pre, during and post. The ROI Marketer® is a rare animal highly sought-after by the C-Suite. Why become a Certified ROI Marketer®? Because 80% of CEOs do not really trust and are not very impressed by the work done by Traditional Marketers. Instead, they want no-nonsense Marketers who know how to deliver business growth: they want ROI Marketers®. As a Certified ROI Marketer®, you'll be able to stand out from other Marketers by proving you are a 360-Degree Performance Machine Trained to Deliver Real Business Results: More Sales, More Market Share, More Prospects, More Conversions™. What makes this Certification Program so unique? 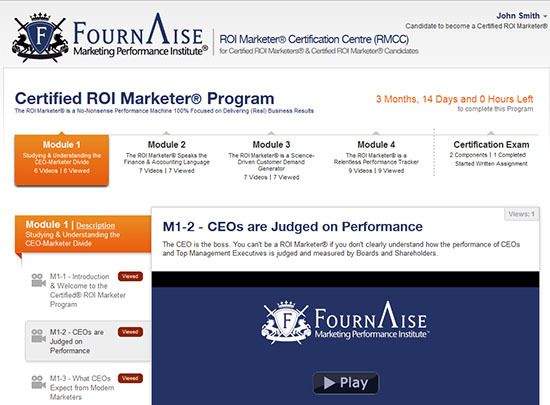 This Exclusive ROI Marketer® Certification Program is based on the key lessons of the (Real) Performance-Tracking results of 30+ million (Real) Marketing Strategies & Ads our parent company, The Fournaise Marketing Group, Tracked & Boosted across all media types, across 20 countries worldwide, 13 industries & 11 languages over the last 13+ years, for Fortune 500 & Large companies, SMEs & Ad Agencies – B2C & B2B. It’s Real Marketing ROI Taught by Real ROI Marketers® with Track Record™. Is this Certification Program applicable to both B2C & B2B? Yes, it is applicable to both B2C & B2B, as the Marketing Performance & ROI approach is very much the same for both, with some differences that will be discussed during the Program. In any case, an ROI Marketer® is comfortable and effective in both the B2C & B2B environments. What is this Certification Program Structure & Curriculum? 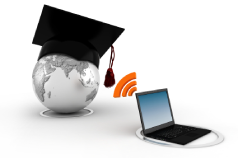 This Program is divided into 4 Modules with a total of 30+ Video Lectures. It contains 200+ Statistics, 40+ Must-Know Formulae & KPIs and 50+ Real Examples & Case Studies from all around the world. 100% eLearning-based, the Program Modules & Video Lectures are accessible 24/7 in our Personalised Self-Service eLearning Platform – the ROI Marketer® Certification Centre (RMCC). How long does this Certification Program take? 100% eLearning-based, the Program Modules and their Video Lectures are accessible 24/7 in our Personalised Self-Service eLearning Platform – the ROI Marketer® Certification Centre (RMCC). So you can study at your own place and pace: go fast or take your time - it's entirely up to you. The Program Modules and their Video Lectures should take a Candidate less than 35 hours to complete, and the Certification Exam around 48-72 hours. How long do I have to complete the Certification Program? The Program Modules and their Video Lectures should take a Candidate less than 35 hours to complete, and the Certification Exam around 48-72 hours. We understand you may be busy with work or studies: therefore, we give you up to 6 months to complete the Program from the moment you’ve registered for it. What are the minimum requirements for this Certification Program? Who is the Program Master? The Program Master is Jerome Fontaine, the Global Chief Tracker of our parent company, The Fournaise Marketing Group. Jerome is one of the World’s Experts in the field of All-Media Marketing Performance Measurement & Management (MPM), and a no-nonsense “5-Star” Level ROI Marketer®. He has a 20-year MPM track record across 25 countries and has applied his Marketing Performance & ROI expertise to/for some of the biggest Brands including Nestlé, United Parcel Service (UPS), Adidas, Volvo, Intel, Dell, Hewlett-Packard, Citibank and HSBC. He is a former Partner, Brand Director & Marketing Services (ROI & Performance) Director at Top Ad Agency Euro RSCG (Havas group) in charge of high profile Brands such as Yahoo!, Philips, Guerlain, Evian Mineral Water, Air France, Vietnam Airlines and Danone. Previously lead Marketer in the Consumer Division of Compaq Computer Asia Pacific (that he joined from the Consumer Division of Compaq Computer France), he was driving the team that made Compaq Presario the #1 consumer selling PC in the Asia Pacific region. Jerome holds a Master of Arts, and a Master of Business Management from EDHEC Lille, one of France’s and Europe’s Top Graduate Business Schools. He speaks several languages fluently. He has written for and has been quoted by some of the top Business & Marketing Publications around the world, including Businessweek, Bloomberg, CNBC, Forbes, Business & Leadership, Chief Executive, Management, Marketing, World Advertising Research Centre (WARC), Marketing magazine, MarketingWeek, Campaign, Brand Republic, Media and hundreds of Marketing blogs. Can I interact with the Program Master? Yes, you can interact with the Program Master whenever you want, with our “Ask Your Program Master” Function: ask questions at any time, and the Program Master will respond to you in full privacy (all questions and answers are private, i.e. just between you and the Program Master). When are the intakes for the year? As the Certified ROI Marketer® Program is 100% eLearning-based, the Program Modules and their Video Lectures are accessible 24/7 in our Personalised Self-Service eLearning Platform – the ROI Marketer® Certification Centre (RMCC). There are therefore no specific intake dates as you can start at anytime. You can study at your own place and pace: go fast or take your time - it's entirely up to you. Program Fees are payable upfront via: (1) Credit Card (Visa, MasterCard, Maestro), (2) PayPal and (3) Applicants can also get their employer to sponsor them. Just select the “Bill my Company” option when registering on the website. Does my Certification have an expiry date? 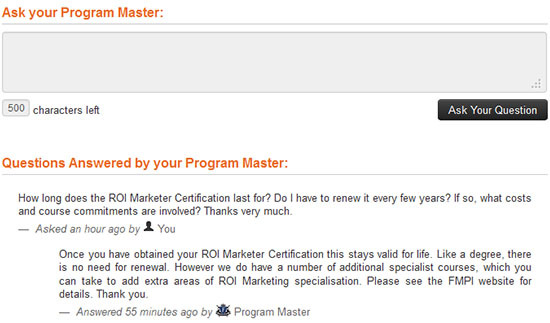 No, once you are a Certified ROI Marketer®, you are a Certified ROI Marketer®. You can upgrade to the “3-Star” or “5-Star” Certification Levels by re-taking the Certification Exam, or you can add to your master Certified ROI Marketer® status with other ROI specialisations we propose. What’s involved in the Certification Exam? The Certification Exam consists of 2 components: (1) Theory Test and (2) Written Assignment. For the Theory Test, you will be given a set of questions and you will need to answer them on the spot, online within the allocated time. For the Written Assignment, you will be given a topic and you will have 48 hours to prepare it offline and then submit it online. What do I get once Certified? Once you have completed the Certified ROI Marketer® Program and passed the Certification Exam, you will be awarded one of our 3 levels of ROI Marketer® Certification: (1) Certified ROI Marketer® - Savvy “1-Star” Level, (2) Certified ROI Marketer® - Pro “3-Star” Level or (3) Certified ROI Marketer® - Elite “5-Star” Level. You will also be entitled to 3 types of Certification Materials, to enable you to show the world that you are a Certified ROI Marketer®: (a) your Certified ROI Marketer® Profile Page in our 24/7 Verification Centre (Accessed by Recruitment, Human Resources, Marketing & Management Professionals), (b) your Certified ROI Marketer® Digital Badge and (c) your Certified ROI Marketer® Text Badge. What if I fail at my Certification Exam? This is rare. In fact 92% of Candidates who sit for our Certification Exams pass them successfully. But if by chance it happens, we will help you by allowing you to re-register and go through the Program again and re-take the Certification Exam. You just need to ensure you study the Program Modules and their Video Lectures well enough to succeed at the Certification Exam.